Much has been written about the Knights Templar in recent years. A leading specialist in the history of this legendary medieval order now writes a full account of the Knights of the Order of the Temple of Solomon, to give them their full title, bringing the latest findings to a general audience. Putting many of the myths finally to rest, Nicholson recounts a new history of these storm troopers of the papacy, founded during the crusades but who got so rich and influential that they challenged the power of kings. Chapters include: The Origins of the Order of the Temple; The Latin East: Defenders of Holy Church; Holy War in the Iberian Peninsula and in Eastern Europe; The Organization and Government of the Order; Religious Life; Commercial and Economic Activities; The Trial of the Templars; The Templar Myth; more. Includes a photo section. Imported from Britain. 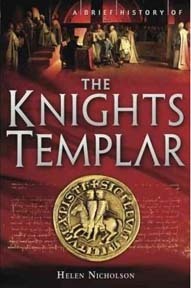 A BRIEF HISTORY OF THE KNIGHTS TEMPLAR By Helen Nicholson. 351 pages. 5x8 Paperback. Illustrated. References. Index.